Misae Sagara is the resident manager at Youhei's dorm. Misae is 23 years old at the time the story takes place; this is only mentioned in the visual novel. She was Hikarisaka's first female student council president when she was in high school. She achieved a full week of perfect attendance for the whole student body and she was loved by the students. Misae is friendly with the dorm students but strict when it comes to the dorm rules. She is also well-liked by the rugby members. 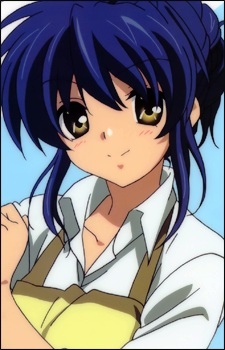 Depending on decisions, Tomoya can change her to a violent dorm lady through his lecture, which is her original personality, who uses brute force to convince the dorm students to do their cleaning duty. Misae is waiting for her lover to return, which is actually her cat—Katsuki Shima. When Tomoya tries to pursue Misae, the cat gives Tomoya a dream about Misae's past. When Misae was still in high school, she met a boy named Katsuki Shima who insisted in granting her wish as a payment for encouraging him to recover. Misae's reluctance on having her wish granted and Katsuki's persistency eventually have their feelings for each other develop further, which also made her elected as the student council president due to her rumors with Katsuki. However, Katsuki realizes that his true identity is not Katsuki but his cat, who gave him the duty of granting Misae a wish before dying. Being conflicted with his duty and his love for Misae, he insisted her on having her wish granted. After announcing her wish on having Katsuki forever loving Misae, Katsuki obliged. Katsuki returned to his cat form, and waited for Misae like usual. Noticing the cat's fondness on her, Misae takes the cat as her pet, without knowing the cat's identity as her lover. At the town's festival, Tomoya tells Misae about her cat's true identity.